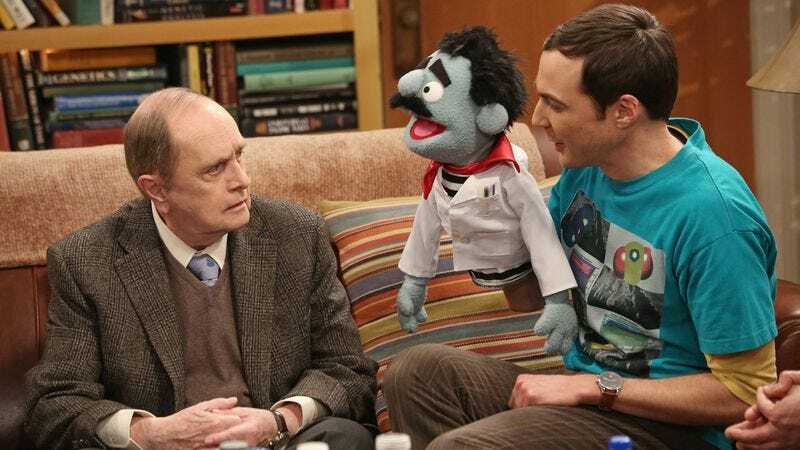 After a streak of strong, character-driven stories, Big Bang Theory turns to sitcom clichés for “The Proton Resurgence,” an episode that is saved by the great Bob Newhart, who brings his signature deadpan delivery to Sheldon and Leonard’s childhood idol: Professor Proton. When Sheldon discovers that the former television science personality is not only alive but doing private shows, he immediately hires the disenchanted 82-year-old to perform for him. There’s not much conflict for most of the episode, with the stakes during the first half reaching a zenith during the scene where Sheldon bothers Leonard while he’s trying to sleep. Once Newhart shows up, though, the episode becomes a reverent tribute to the influential sitcom star disguised as a goofy plot about an aging scientist and two overgrown children. This episode maxes out at a B grade for not including Amy Farrah Fowler in the story, but that’s because the writers need Sheldon to look as pathetic as possible when he meets Professor Proton, who prefers to go by Arthur. Sheldon is so enthusiastic to meet one of his childhood heroes that he frightens the man, and after watching Sheldon for six seasons, it’s not difficult to see why someone would see Sheldon as a threat upon first meeting him. He’s intense and obsessive, and he lacks a filter and sense of empathy, making him difficult to read and slightly unnerving to be around. Add in the fact that he’s a grown man begging for a presentation intended for small children and the whole situation gets even creepier, although Sheldon is mostly harmless. “Mostly” because just being around Sheldon eventually causes Arthur’s pacemaker to malfunction, landing him in the hospital with Sheldon as his ambulance mate. The second half of this season has taken great strides to make Sheldon a more sympathetic character, debunking my earlier theory that he was to be this season’s big bad. This week, he helps Arthur realize the importance of Professor Proton, a role that he’s been eager to forget. Arthur has a PhD, but he’s laughed at by other scientists and forced to perform at kids’ birthday parties to survive. Sheldon and Leonard help Arthur realize what an inspiration Professor Proton was to thousands of kids that have grown up to become notable names in their fields, and Arthur has had a part in every new discovery made by those that watched his show as children. Sheldon tells Arthur about how he didn’t have very many friends growing up and that having Professor Proton on television meant there was always someone for him to connect with, leading him down the path of physics, rather than vagrancy. The fact that these inspirational lines are directed to a sitcom legend adds a certain meta-tribute quality to the episode, which ends with this generation’s big CBS star singing “Soft Kitty” to one of the biggest figures in the network’s history. Penny’s character gets the worst treatment in this week’s episode, and she’s at a level of dumb blonde that we haven’t seen since this show’s early seasons. The script treats her like Leonard’s trophy girlfriend when Arthur first appears, and once the presentation begins, she just starts acting dumb. She’s completely floored by the idea of a potato clock, and when Arthur’s pacemaker malfunctions, she wonders if there’s a way they can hook it up to the potato. Sure, Penny’s dumb, but she must have learned over the course of her friendship with the nerds that you can’t jumpstart a Pacemaker with a potato. Even if she’s just learned that a potato can power a clock. I like to have faith that Penny has gotten smarter since moving in across the hall, but this episode disregards any intellectual progress she’s made. It was only a matter of time before Howard and Bernadette started thinking about a baby, and taking care of Raj’s dog Cinnamon makes them consider the idea of expanding their family. That is, until they lose the dog. It’s a stereotypical sitcom scenario, but Simon Helberg and Melissa Rauch are so good at what they do that it’s easy to forgive the uninspired plot. Their rapid-fire banter and ability to transition from playful comedy to high-stakes anxiety gives their scenes a great energy, and when they get the chance to make fun of Raj’s accent, the results are hilarious. Another friend of Raj ends up finding Cinnamon and contacting her owner, but when he tries to berate Howard and Bernadette, she turns the tables and shows brilliant guilt trip skills to deflect all attention away from their mistake. Maybe those two will make great parents after all. Howard is turned on by the sound of Raj’s voice. I’m not going to touch that. Sheldon’s flailing while he yells “It’s happening!” is one of my favorite bits of Jim Parsons physical comedy this season.